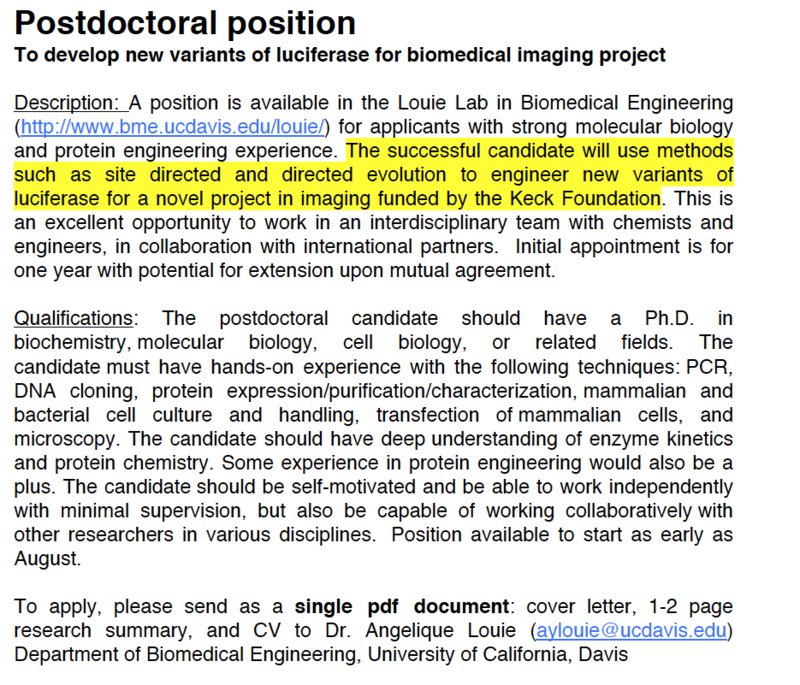 Description: A position is available in the Louie Lab in Biomedical Engineering (http://www.bme.ucdavis.edu/louie/) for applicants with strong molecular biology and protein engineering experience. one year with potential for extension upon mutual agreement. Qualifications: The postdoctoral candidate should have a Ph.D. in biochemistry,molecular biology, cell biology, or related fields. The candidate must have hands-on experience with the following techniques: PCR, DNA cloning, protein expression/purification/characterization, mammalian and bacterial cell culture and handling, transfection ofmammalian cells, and microscopy. The candidate should have deep understanding of enzyme kinetics and protein chemistry. Some experience in protein engineering would also be a plus. The candidate should be self-motivated and be able to work independently with minimal supervision, but also be capable of working collaboratively with other researchers in various disciplines. Position available to start as early as August. About UC Davis: The Department of Biomedical Engineering at UC Davis has 32 faculty, and is a vibrant and multidisciplinary community of more than 120 researchers. The Department is internationally renowned for its research in biomedical imaging, enjoys strong institutional support, and is ranked #6 in the nation, and #1 in California, based on research expenditures by the National Science Foundation. UC Davis also has a School of Medicine (including an NCI- designated Comprehensive Cancer Center), a School of Veterinary Medicine, the California National Primate Research Center, and the Institute for Regenerative Cures offering unparalleled opportunities for collaborative and translational research. Davis is located within 1- 2 hours of San Francisco, Napa Valley, Lake Tahoe and the Northern California coast offering access to a wide range of outdoor and cultural activities and an excellent quality of life. Author Jonathan EisenPosted on August 2, 2016 Categories Misc.Tags Misc.